"When we teach, we have to emphasize creativity, communication, teamwork, design thinking and innovation..."
At the 2017 State of the University, President Neal Smatresk highlighted the significant progress UNT has made in recent years and detailed the steps UNT will take to transform into the next generation research university students need to be successful in the digital economy. "When we teach, we have to emphasize creativity, communication, teamwork, design thinking and innovation so that we can robot-proof our students," Smatresk told an audience of UNT community members attending the event and watching via live stream. "These are great skills, skills that aren't easily emulated by machine intelligences." Finances and infrastructure have improved dramatically. UNT's academic reputation is growing across the board with 69 programs ranked in the top 100 nationally. Athletics is on the rise. 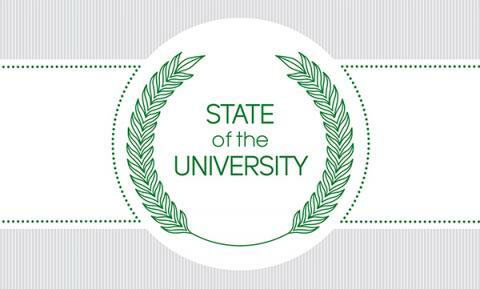 UNT students are becoming more successful as a result of these changes. "We set our sights on providing our students the best education in the state of Texas," Smatresk says. "…We knew this wasn't a one-, two or three-year project. This is a marathon, not a sprint. It's going to require consistency, discipline and a plan." Continue building research, bringing UNT's creativity and technology strengths together to move from STEM to STEAM. Focus on recruitment and retention to help students succeed – and drive revenue. Improve student access to education and improve learning by using new technologies and expanding regional campuses. Partner with the private sector to build better curricula and to leverage their expertise. Watch the video, Becoming a Global Leader in Education Innovation, where UNT community members discuss the changes necessary to provide students with optimal learning experiences and help UNT become a next generation research university. Watch the video, UNT’s Foundation for Success, which highlights accomplishments since Smatresk’s UNT arrival in February 2014.